Home :: Mikrotik Rack Mount Routers :: Mikrotik RouterBoard RB3011UiAS complete router / layer 3 switch with 10 Gigabit Ethernet ports and 1 SFP port with rack mount case and power supply - New! Mikrotik RouterBoard RB3011UiAS complete router / layer 3 switch with 10 Gigabit Ethernet ports and 1 SFP port with rack mount case and power supply - New! Mikrotik's RB3011 is a new multi port device, and the first to be running an ARM architecture CPU for higher performance than ever before. 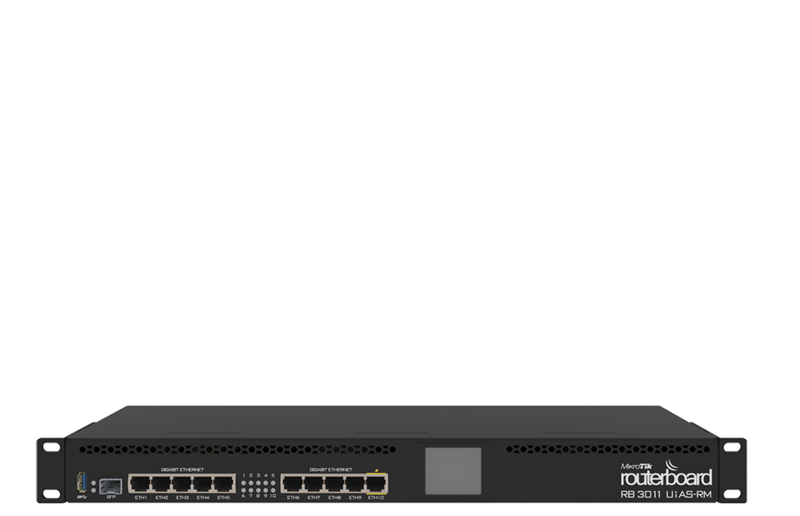 RB3011UAS-RM has ten Gigabit ports divided in two switch groups, an SFP cage and for the first time a Superspeed full size USB 3.0 port, for adding storage or an external 3G/4G modem. It’s powered by the new dual core 1.4GHz ARM CPU with 1GB of RAM, and a Level5 RouterOS license. RB3011UAS-RM comes in a rack mount case. 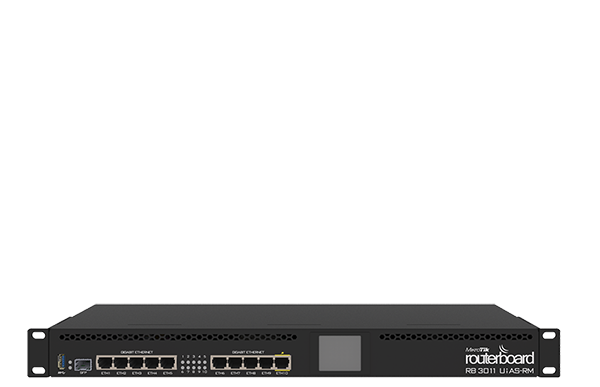 The RB3011UAS-RM has 11 ports: Gigabit SFP cage and five Gigabit Ethernet ports that can be switched together providing affordable wirespeed Fiber-to-Copper converter, and additional five Fast Ethernet ports. Board can be powered by power jack or PoE. RB3011UAS-RM supports any 1.25G SFP transceivers that is within the SFF Committee specifications for SFP Transceivers.